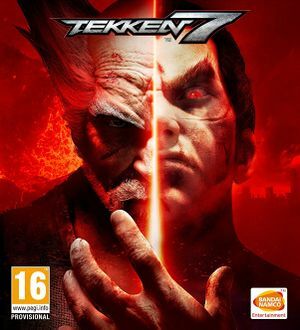 Port of the Fated Retribution upgrade for Tekken 7 released in arcades. Unknown AA implementation from low to high and resolution scale going up to 200%. Framerate capped at 60 FPS; game logic tied to framerate. This removes a layer of image blurring, making the game look cleaner. For further cleaning, consider disabling the anti-aliasing provided by the game. Open Scalability.ini in the WindowsNoEditor folder. @2 and @3 indicate the High and Ultra quality presets respectively. r.SceneColorFringeQuality controls the chromatic aberration and r.Tonemapper.Quality controls the film grain. 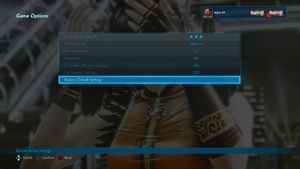 Download Tekken 7 3D Vision Fix. Extract the contents to <path-to-game>\TekkenGame\Binaries\Win64\. F3: HUD toggle (with a nice collapse animation). F4: Bloom and lens dirt toggle. Enabled by default. F5: Depth of field toggle. Disabled by default. 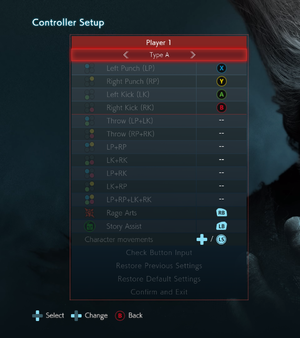 Remap menu for XInput controllers. 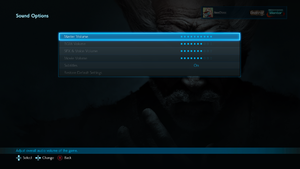 Remap menu for DirectInput controllers and keyboards. Keys are mapped to XInput controller inputs. XInput and DirectInput controllers supported. DirectInput controllers must map to XInput controller inputs. Most common controllers automatically bound, less known controllers require keyboard for binding process. 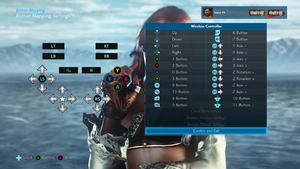 For dualshock, use the DS4 Icons replacement for Tekken 7 Mod. In the Tekken series, certain characters speak their native languages. However, some characters speak in different languages due their story backgrounds. Only Dragunov, though he's Russian due to his background, but does not speak in every series. 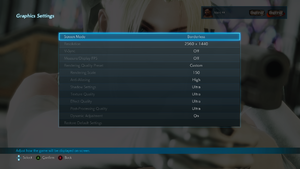 See Helix Mod: Tekken 7. ↑ 1.0 1.1 File/folder structure within this directory reflects the path(s) listed for Windows and/or Steam game data (use Wine regedit to access Windows registry paths). Games with Steam Cloud support may store data in ~/.steam/steam/userdata/<user-id>/389730/ in addition to or instead of this directory. The app ID (389730) may differ in some cases. Treat backslashes as forward slashes. See the glossary page for details. ↑ Graphics Settings, pre-load, Steam Cards, and more! ↑ Steam Community :: Guide :: Remove Blurry Chromatic Aberration. ↑ 6.0 6.1 Katsuhiro Harada on Twitter: Remember, TK7 has P2P network & 3 platforms. It's not my issue. 1st party security issue. Ask 1st party and don't ask me again. This page was last edited on 14 April 2019, at 21:12.